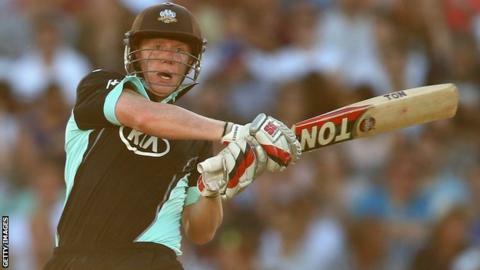 Surrey have re-signed Ireland all-rounder Kevin O'Brien on a short-term deal to play in the T20 Blast. The 30-year-old scoring 72 runs. He will be available for the first part of the tournament before fulfilling Caribbean Premier League commitments with Trinidad and Tobago Red Steel. "I loved it last year, it helps playing in front of big crowds," said O'Brien, who is set to play in Surrey's Blast opener against Sussex on Friday. "Hopefully this season I can hit the ground running and I can put in some good performances for the team." The Dublin-born limited-overs specialist initially joined Surrey last July, but had already moved on by the time the county lost the T20 final against Northants at Edgbaston. "Last season was a successful tournament for Surrey, despite falling at the last hurdle," O'Brien added. "Hopefully we can play some good cricket, the changing room is full of some world-class players so it's an exciting tournament to get involved in." O'Brien has played 77 one-day internationals and 37 T20 matches for Ireland and smashed a 50-ball century against England in 2011, the fastest in the history of cricket's World Cup. He was a member of Ireland's squad at the World T20 in Bangladesh earlier this year.